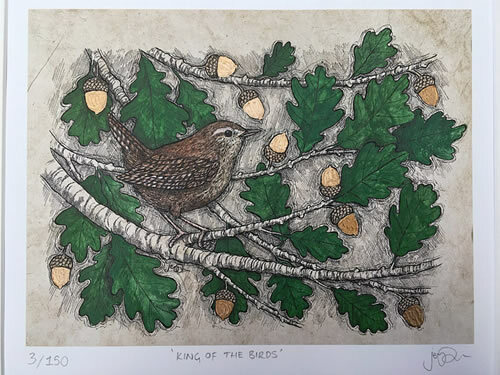 Limited edition print of Jennifer's illustration 'King of the Birds', featuring a little wren taking refuge in the branches of an oak tree. The print is taken from her original dip pen, ink and watercolour illustration, done on sustainable handmade paper with indian ink. Each print also has handpainted gold acorns. The name of this illustration is taken from an old folktale, where all the birds want to elect themselves a King. They decide to grant the kingship to whichever bird can fly the highest. Each bird has his turn until it comes to the eagle. The eagle flies higher than all those before, however hiding in his feathers is the tiny wren, who jumps up and flies a few centimeters once the eagle can go no further. He is thus elected 'King of the Birds'.